Stepping out the back door of my cousin’s house to shake out a rug, I heard what sounded like a high-pitched scream. The sound penetrated me to my core, and was immediately disturbing. I looked over my right shoulder, in the direction from which the sound was coming, and have never since forgotten what I saw. The sound was coming from a large, barn-like building to my right, whose door was open to vent the heat. Through that door, I could see several large hogs, strung up by their front hooves, wriggling and screaming. They were about to die. It was then I understood: the sounds were coming from a slaughterhouse. Fear, sadness, and guilt are some of the emotions that swirled through my chest that day, and my relationship with meat has only grown more complicated since then. Growing up on a dairy farm, I’ve always been in close contact with domesticated animals, and watched as they were loaded onto trucks and carted off to be killed. Unwisely, I even considered some of these animals to be “friends”, which is really not something you should do in that sort of situation. You would think then, judging from these misgivings about institutionalized slaughter, that I would be a vegetarian. But I’m not. Regular struggles with anemia and fatigue have always made that seem a bad decision, at least for me. I know that your body can still get all the nutrients it needs from a plant-based diet, with the exception of vitamin B12. However, supplementing an essentially plant-based diet with small amounts of animal protein, as most Asian diets do, is the safest way to ensure that any nutritional gaps are filled. This can be particularly important for people who are ill, have weak digestion, or have certain health problems, like anemia. I suppose that’s why I have mixed feelings about the record-breaking consumption of pork in recent years. I’m not of the opinion that pork, as a meat source, should be avoided completely. I believe a moderate diet containing a wide variety of foods is best. But it now appears that, as a society, we’ve been eating so much bacon that US bacon reserves have hit a 50 year low. We haven’t consumed this much bacon since 1957! Pig farmers keep increasing production, but can still barely keep up with demand. For the first time in history, pork has equaled, and sometimes even surpassed, beef production. All this may be very good for pig farmers, but is not very good news for our health. 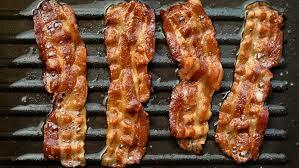 As a cured meat, bacon is known to be high in three very bad things: nitrates, saturated fat, and sodium. In 2015, the World Health Organization listed bacon and other cured and preserved meats as group-1 carcinogens, on the same level with cigarettes, asbestos, and uranium. While you may roll your eyes over that declaration, the group-1 classification is pretty damning. It means there’s no question that cured meats cause cancer. But before you get panicked or upset, remember that when it comes to cancer, it’s always about accumulated exposure. Smoking is still more deadly than eating bacon because smokers ingest more carcinogenic particles per day. You would have to eat a whole lot of cured meat, pretty much every day, for years and years, before your risk of colorectal cancer equalled the risk of cigarettes, simply because most smokers smoke multiple cigarettes per day, easily surpassing the safe limits of exposure. Those of you who are concerned about your health, but still love the taste of bacon, will try to side-step concerns about nitrate exposure by choosing “natural”, preservative-free bacon. However, even “natural” bacon is usually made with celery juice or celery powder, both of which contain naturally-occurring nitrates. Naturally occurring nitrates, are still nitrates. Once inside your body, they operate the same way. Unfortunately for bacon-lovers, bacon is also high in saturated fat. Fully 68% of its calories come from fat, and half of that fat is the unhealthy, saturated kind. In recent years, many news outlets virtually squealed with delight when researchers found that diets high in sugar are actually worse for heart health than diets high in saturated fat. However, just because sugar is also bad, doesn’t mean saturated fat has been exonerated. Saturated fat still increases levels of LDL cholesterol in your bloodstream, and as such, will still increase your risk of heart disease and stroke. If you want to choose a protein source to maintain muscle mass and elevate iron levels, you could certainly make a healthier choice than bacon. Finally, cured meats like bacon are also very high in sodium, which is known to raise blood pressure. According to the UK group Consensus Action on Salt and Health (CASH), bacon contains “huge and unnecessarily high amounts of salt”, and as bacon consumption has risen, it has become the second-biggest source of salt in the UK diet, after bread. Multiple studies have consistently found that reducing sodium intake is the first, best way to quickly bring down high blood pressure for the majority of people. Yet, on an individual level, things can get messier. Those with weakened adrenal functioning may actually require more salt, so a reduced salt diet would not be helpful for them. In this case, the weakened adrenal glands produce smaller amounts of aldosterone, the hormone which regulates sodium, potassium, and magnesium levels in the body. When aldosterone production becomes too low, too much salt can be lost through the increased flow of urine, causing a sodium deficiency. Even scientific researchers have noted that poor diet, increased weight, and alcohol intake may have a stronger effect on blood pressure than salt. But because each of these negative health measures tend to occur in tandem, it’s difficult to tease out which one has the strongest effect. To sum up, there are several, substantial negative health effects that come from eating a lot of bacon, which makes our increased consumption of bacon a concern. Bacon is even becoming difficult to avoid, as more and more restaurants add it to their menu options to increase the taste value of their food. Yet, concerns about screaming pigs aside, there is no real harm in eating bacon on an occasional basis, as long as the rest of your diet is sensible and healthy. If you are anemic, maybe you should consider an iron supplement (not ferrous sulphate; there are better kinds available now, such as Megafood Blood Builder); better yet, maybe you’d be better off further investigating anemia, which is not just one thing. If you read up on this, you will see that it can get rather complicated. There are other forms of anemia other than just the simple iron-deficiency kind. There is also a kind of anemia associated with deficiency of Vitamin B-6. In Chinese medicine, B-6 is Earth phase. There is also anemia associated with lack of Vitamin E (metal phase) or folic acid. And of course B12. By the way, some years ago a scientist tested countless types of meats and other animal foods and discovered that there was no B12 in any of them. I would bet my last dollar that the vast majority of the people tested as being low in B12 do eat meat and other animal products regularly. It is not a simple matter of “just eat meat, milk and eggs and you’ll be okay where B12 is concerned”. Modern people are degenerated badly and can hardly digest their food anymore. If animal flesh and other animal foods do contain Vit B12 it is because the farmer feeding his animals a mineral and vitamin supplement is standard procedure. Not because there is something magical about all animal foods. I know this because I have raised livestock (not for killing). Now about your claim that “sodium” is bad for us. No, sodium is not bad for us. Excessive salt (sodium chloride) is bad for us and only if we don’t take in enough pure water. Organically bound sodium such as is found in celery is wonderful for our health. I was taken aback at your statement, ” Yet, concerns about screaming pigs aside, there is no real harm in eating bacon on an occasional basis, as long as the rest of your diet is sensible and healthy.” Is this some sort of reverse psychology, or do you really believe that the way we get our nutrients does not matter? I don’t see myself as some sort of unthinking, unfeeling machine like a car, aircraft or lawnmower where all you do is put in the right fuel and all’s well. Thanks for your suggestions. While my blood work has never shown a low iron level, I frequently suffer from “blood deficiency” according to Chinese medicine. To help remedy this problem, I take herbs to nourish my blood on a regular basis. No doubt, I probably have a deficiency in some B vitamins too. I generally try to eat well, but prefer not to take vitamin pills because I don’t believe they’re assimilated well. We’ve had a number of customers tell us that they see entire vitamin pills come out during liver flushes, which leads us to wonder how efficiently they’re ever broken down. The study you mentioned about animal meats lacking vitamin B12 would be interesting to read, if you can provide a link. Also, I agree with your remark that sodium is not necessarily bad, just when present in the high quantities we eat it in our modern diet. Some people may even need more sodium to ensure adequate blood volume so that blood pressure does not drop too low. While the Buddha sat under a tree, he happened to watch a farmer as he tended his field. He realized that in order for the farmer to plant his crop, he had to kill all manner of life forms. Firstly, he took away forest habitat when he prepared his field. Then, in the tilling of the soil, and the planting of his crop, he destroyed even more life with his boots and his hoe. When wild animals came to eat his crops, he killed them. During this contemplation, the Buddha realized that everything we do in life causes pain and suffering. In fact, there is no way to exist without it. All we can do is be aware of this suffering all around us, and try to minimize it as best we can. I did not mean to sound flippant when I wrote the phrase “concerns about screaming pigs aside”. I am aware that virtually every decision I make throughout the day causes death somewhere. Just by driving my car to work each day, I have killed beings through the extraction of oil and gas to make it run, through the mining of metals necessary to manufacture it, through the insects or small animals I may hit as I drive it. Essentially, as long as we are alive, we cause death. We can never be perfect in our choices, but it does help to be mindful of them, and to be thankful for any sacrifices made on our behalf. I love you…..and your love that is extended to the animals in our care. Thank you for taking the time to write what was in my own heart and mind. I’ve just seen your reply Rebecca to Wyandotte and although I love you no less, I do feel that there is an enormous difference between the cruel intentional slaughter of beautiful and intelligent creatures like pigs, and the accidental killing of insects under our feet. Killing wild animals to protect crops is equally abhorrent to me. There is always a kinder and alternative way.